Dawn patrol in Alaska is at 9 in the morning. Pretty hilarious. 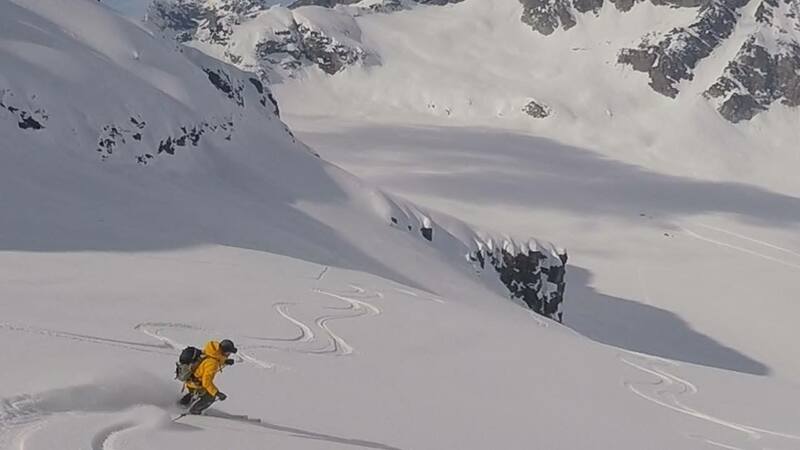 There is plenty of daylight to get in a full ski day even in mid winter in Alaska, plus the sun doesn’t bake the snow too much which can make it dangerous. Stu Brown took us to ski Sunburst in Turnagain Pass near Anchorage. When we first pulled up it was white out fog, but as we skinned up, it turned bluebird. The snow was stable with a firm hard base as it was warm prior weeks, then we hit a cold spell about 9F. The pow was soft and creamy and the whole Anchorage gang was out full of smiles with their handsome dogs frolicking around in the snow. Nice scene out there. We stayed with Stu and met some of his friends, and had dinner with Mike and Dayna. Nice time in Anchorage. Anchorage is looking nicer and getting fixed up a bit. Its very diverse with Koreans, Samoans, Philipinos, Native Americans, and Hispanics. People in Alaska sure are nice. They let us stay with them at their house, lent us a car. There are not many tourists in Alaska in December….maybe 4?